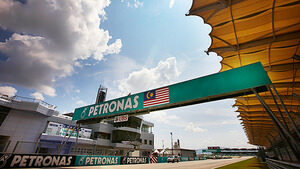 Just outside of Kuala Lumpur, the Sepang circuit offers a unique challenge to drivers. The Hermann Tilke designed track begins with a long straight the curves into a twisting first section, and it ends with a similar long straight that ends in a tight hairpin. Between the two are sweeping corners, with just a few tight turns to raise the difficulty level. Throw into that the high humidity and potential for torrential rain, and it's a difficult stop on the calendar.